Would it meet expectations? Would it be all the boys hoped for, dreamed about, sang about? 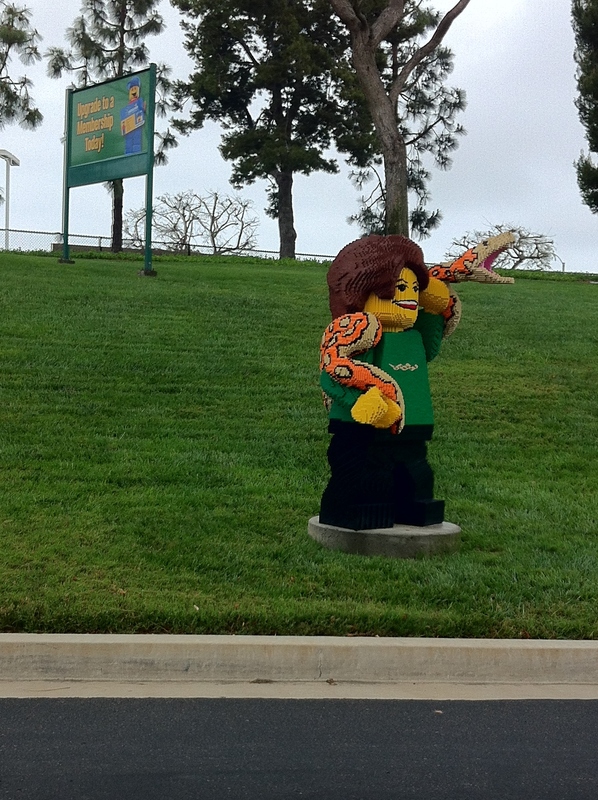 A lot of people decided to see Legoland on this cold, grey day. More would have come if it was sunny, but the lineup to get into the parking lot was not that bad. Took 20 minutes depending on how you count where the line actually started. 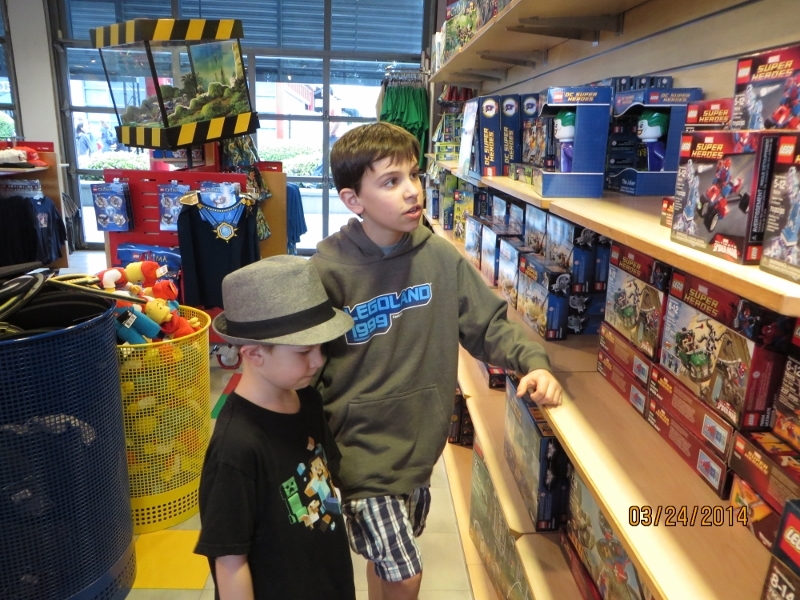 We looked out the window at the legomen built by the side of the road. People-sized lego. One had a snake. the boys like snakes. 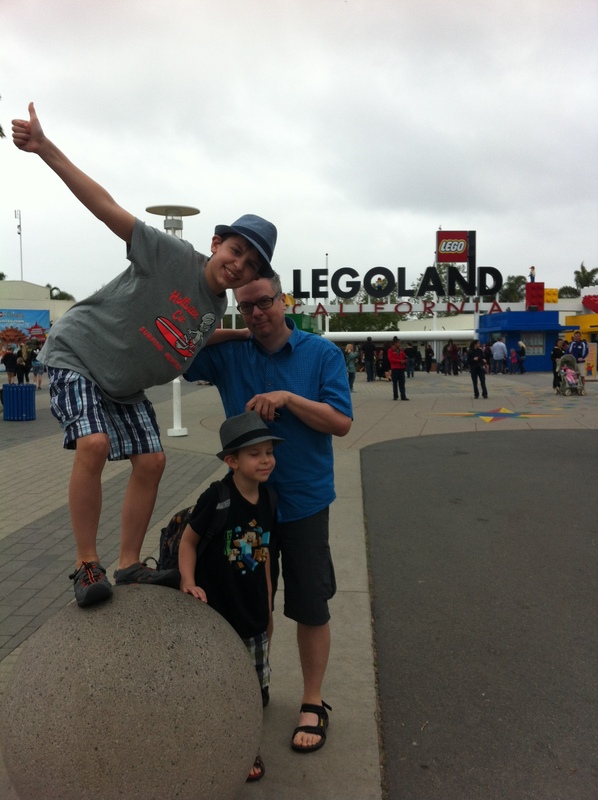 One had a legoman taking a picture of his three lego buddies and in his viewfinder, they’d lego’d his three friends. IN HIS VIEWFINDER! That’s attention to detail! 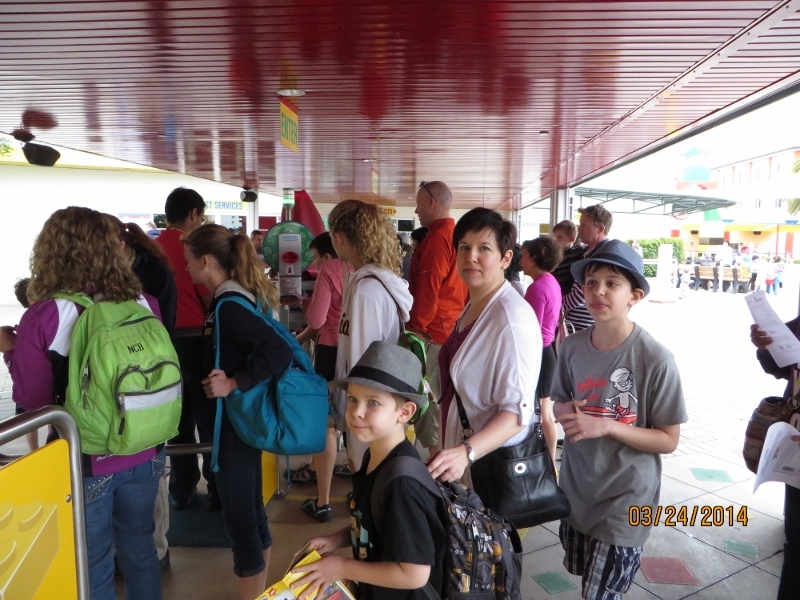 As we inched forward, we planned what we would see first, which way we’d turn to get there, what ride they were most excited to go on, what thing they were most excited to see. By now, the boys were all gigglie and excited and ready to explode like air bags out of the car. We parked in the preferred parking for $10 extra dollars. My thinking was, at the end of the day, literally, I would likely pay a billion dollars not to have to walk any farther than I had to on sore feet. I try to go for a walk every day, but this would be the first time in a LONG while that I would walk for hours and hours and hours. But experience told me three things. Wear good shoes. Sit whenever you can, even if it’s on a spiky fence railing. And shave off any walking distance you can. The boys leapt out the car like sled dogs waiting to pull a sled. The prettiest girl in the world and I got out, took the backpack and a very deep breath. To their credit, the boys, unlike some little kids all excited and stuff, did not race across the parking lot. They walked with us. Even stood still for a picture, though, as you can see, still is a relative word. I would have preferred sunshine, to be honest. A lot of it. Not only was I wearing a layer of sunscreen so thick I could have scraped off a layer and covered a schoolbus full of children. The Prettiest-girl-in-the-world tittered at me when I put it on, but I’m an indoor Joe and burn easily so I didn’t want to take a chance. Plus we had all dressed for warm weather. See. Shorts. T-shirts. Awesomely cool hats. No coats or hoodies. Oh, they were back at the hotel, but in the backpack, ah, no. So, first stop, get some hoodies! We bought the tickets, $300 worth, and I gave them to the oldest so he could present them to the ticket taker person. I said they’d ask, could I see your tickets, please, sir? And he was to reply, in his best English accent, why yes ma’am, I have them right here. First disappointment, she just said, “tickets?” which totally threw off the oldest. He replied, “Errr, yes, umm, I, err … tickets!” Then he thrust them at her, head down. I told the agent what I thought she’d say and she smiled and told the oldest that he had something on his shirt and when he looked down, she flicked his nose. And old trick but it made us all laugh. All the lego workers, (at the risk of giving any spoilers) were amazing and friendly and awesome. The prettiest girl in the world dragged us out and the youngest chose the place he wanted to see first. Was it the coolest ride in the universe? 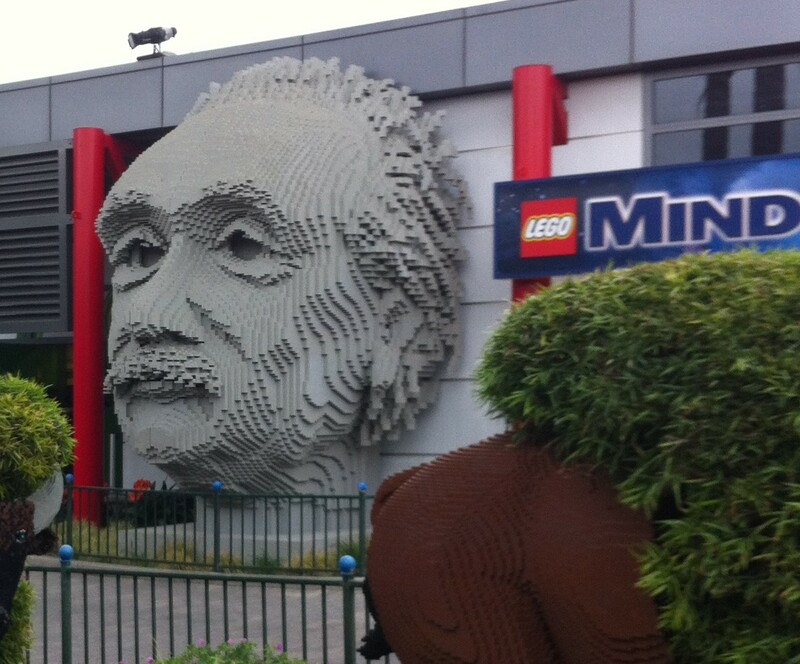 Was it the more awesome lego structure (which for me was the HUGE Einstein face)? Was it food or a bathroom or something where one brother got to spray another brother in the face? 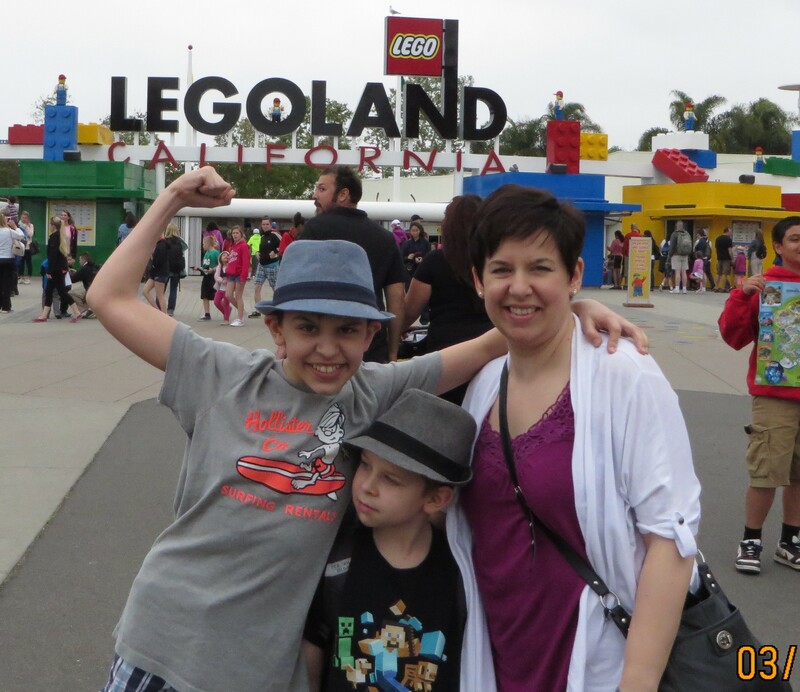 This entry was posted in Parenting, San Diego, San Diego Safari, Travel, Traveling with Kids, writing and tagged legoland entrance, legomen, preferred parking, prettiest girl in the world, san diego weather, sunscreen. Bookmark the permalink.